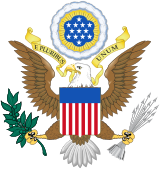 The first presidential election in which the District of Columbia participated was the election of 1964; starting with that election, the District of Columbia has consistently had three members of the Electoral College. Since the passage of Twenty-third Amendment, all but one of the district's electoral votes have been cast for the Democratic Party's presidential candidates. The Twenty-third Amendment did not grant the district voting rights in Congress, nor did it grant the district home rule. Many citizens of the district favor statehood or further constitutional amendments to address these issues. 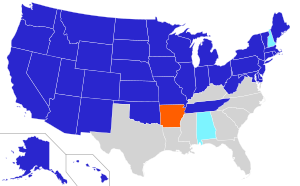 The amendment was rejected by Arkansas on January 24, 1961. Nine states took no action on the amendment: Florida, Kentucky, Mississippi, Georgia, South Carolina, Louisiana, Texas, North Carolina, and Virginia. While perceived as politically neutral and only somewhat liberal-leaning at the time of passage in 1961, the District swung dramatically toward the Democratic Party in the years after passage. African-Americans voted in greater numbers than they had in the 1940s and 1950s with the clearing away of restrictions on the vote, and their share of the District electorate increased - according to the 1970 census, 71% of the Federal District was black, a dramatic jump. Accordingly, the District has sent its 3 electoral votes to the Democratic candidate in every single presidential election since 1964, including the 1984 landslide re-election of President Reagan, where only the District of Columbia and Minnesota voted for Democratic candidate Walter Mondale. The District's electoral votes have yet to prove decisive in a presidential election. The smallest Electoral College majority won by a Democratic president since the Twenty-third Amendment's ratification was the 56 vote majority achieved by Jimmy Carter in 1976. ^ Breneman, Lory (2000). Tamara Tamara (ed.). 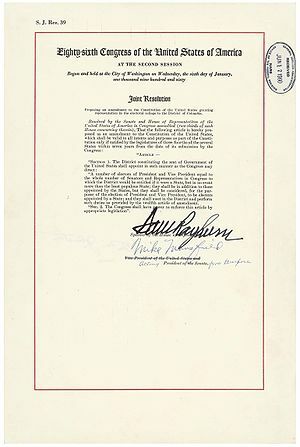 Senate Manual Containing the Standing Rules, Orders, Laws and Resolutions Affecting the Business of the United States Senate (Senate Document 106-1 ed.). Washington, D.C.: U.S. Government Printing Office. p. 959. Retrieved April 16, 2014. Vose, Clement (1978). "When District of Columbia Representation Collides with the Constitutional Amendment Institution". Publius. Oxford University Press. 9 (1): 105–125. doi: 10.2307/3329772. JSTOR 3329772.